Music evokes images as well as emotions. 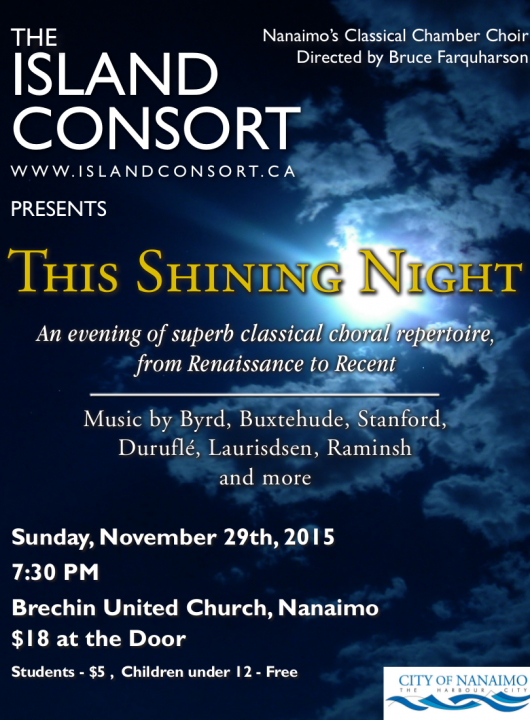 “This Shining Night” is a program that is luminous and evocative – a choral performance of musical treasures by the Island Consort chamber choir; an eclectic mix of Early Music, Opera, Art songs and Folk. This accomplished 18-voice choir, directed by Bruce Farquharson, sings with sincerity and clarity. The evening begins with Durufle’s serene “Ubi Caritas” which leads to William Byrd’s Renaissance work, “Mass for 4 Voices”. Two selections from operas follow: Sharon Sinclair and Elizabeth Grenon to sing the soprano-alto duet, “Abendsegen”, from Humperdinck’s Hansel and Gretel, and Skye Donald to sing the soprano aria “Vissi d’Arte, from Puccini’s Tosca. What follows is a set of 3 pieces by early 20th century Irish composer, Charles Stanford; two motets, “Justorum Animae” and “Beati Quorum Via” and art song,” The Bluebird”. And a beautiful arrangement of a popular Latvian folk tune, “Blow Winds” – by Imant Raminsh – brings the first half to a close. The second half opens with two movements from Buxtehude’s Baroque cantata “Membra Jesu Nostri”, with accompaniment by Peter Orme (organ) and strings players from the Nanaimo Chamber Orchestra. This work also features soprano and alto solos by members of the choir. Then, a nod to the Christmas season with a contemporary arrangement of a Renaissance carol, “Now May We Singen” by Cecilia McDowall, followed by Morten Lauridsen’s “Sure On This Shining Night”, based on lyrics by American poet, James Agee. The concert will end with a new arrangement by Casey Rule of everybody’s favourite, “Danny Boy”.